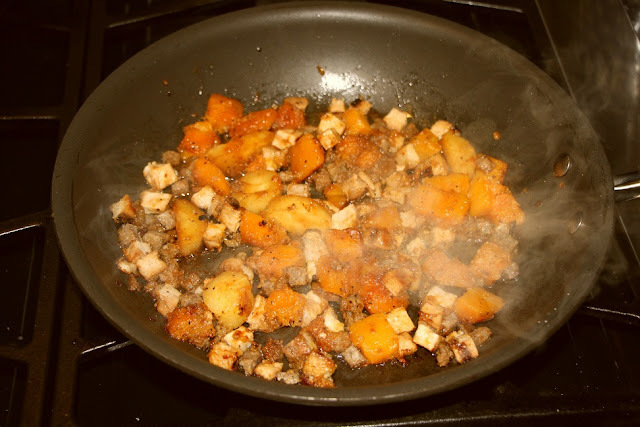 We've been doing quite a bit of cooking lately and had leftovers from two recent meals – the Grilled Pork Chops and Root Vegetables and some Posole Ala Lea Ann (No new post for this meal). I'm not sure how it has happened, but Bev used to cook most of the suppers and I made most of the breakfast meals form leftovers, but somehow this has been reversed. I think it could be that she is more willing to start working earlier then I am. For the first breakfast, Bev cut up the leftover chop, made the veggie pieces smaller, added a couple pieces of cooked breakfast sausage and made hash from the pork and root vegetables. Another hard time in the life of our four legged kids - Romeo lays on his back way more than any dog we’ve had. I had been thinking of something different for a St. Patrick’s Day meal than our usual corned beef and cabbage and when I read a recent blog post for a delicious looking Irish Beef Stew I thought it might be the answer until I noticed it contained beer and I knew there was no way to slip that by Bev. But I still liked the idea of stew and in looking at various recipes I discovered that Irish stew is pretty basic stew often using lamb – another Bev no-go – and beer. So I recalled a dish we made a while back and has often has crossed my mind. I did a little blog research and discovered that is was way back in 2010 when we made it and we said we loved it so I decided it was a go – subject to the bosses approval. Folks our age were the kids of the kids who grew up during the Great Depression and as such most of our parents knew how to stretch their food budgets including making salmon cakes (patties for us) from canned salmon – I don’t know how old I must have been before knowing that tuna and salmon was actually a fresh fish – I did know that ham was available other than Spam though. Seems like everyone’s mom had their own recipe for salmon patties using different fillers – I believe mine used oats and quite a bit more than Pam's recipe - we likely had salmon flavored fillers. As Bev and I were reminiscing the other day, we decided we wanted to make some patties from canned salmon (even though we have the real deal in the freezer) but using a more modern recipe and we chose Pam’s version from her For The Love Of Cooking blog. 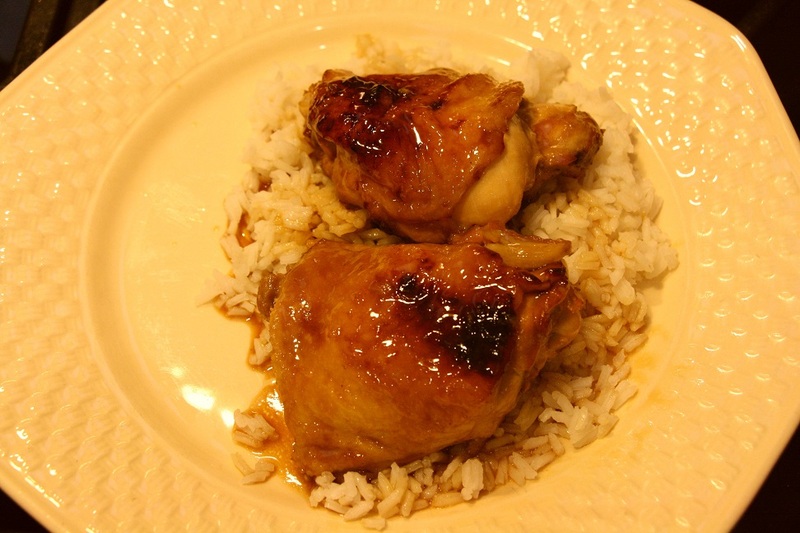 Check Pam’s blog for the original recipe and some great pics. 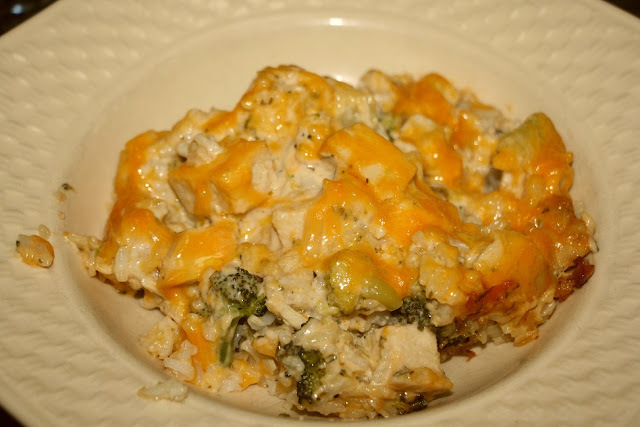 We were out of leftovers so it was time to cook something and we didn’t want to go to the store, so we discussed what we could make and decided we had the ingredients on hand for a chicken broccoli casserole and found a recipe requiring only minor changes. The recipe came from Cathy at Wives With Knives - and was originally from Trisha Yearwood. Bev and I both like Italian (perhaps my favorite) and we had been wanting to make Bolognese Sauce, and we decided to try a different one than we had made in the past. 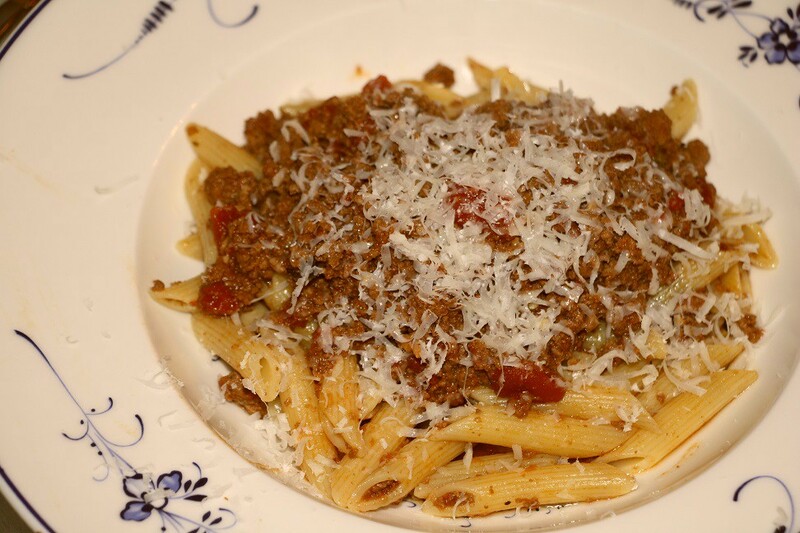 I looked around the web and adapted a couple of recipes to come up with one that sounded good and was pretty traditional – a meat sauce rather than a tomato sauce with meat in it. I thought it was good but not outstanding and I think I may have got it too dry. We’ve had some Tasso in the freezer for a while and Bev’s lingering mouth sensitivity has improved to the point that she can now enjoy mildly spicy food so we decided to whip up a batch of white beans using the Tasso in lieu of our normal ham hocks. I went a step further and found an actual recipe for White Bean And Tasso Soup at Louisiana Kitchen and Culture then adapted it just a little by using less water, chopping the Tasso at the beginning, and not blending part of the beans to thicken it – all personal preferences). Add all ingredients to a large Dutch oven; bring to a boil over high heat. 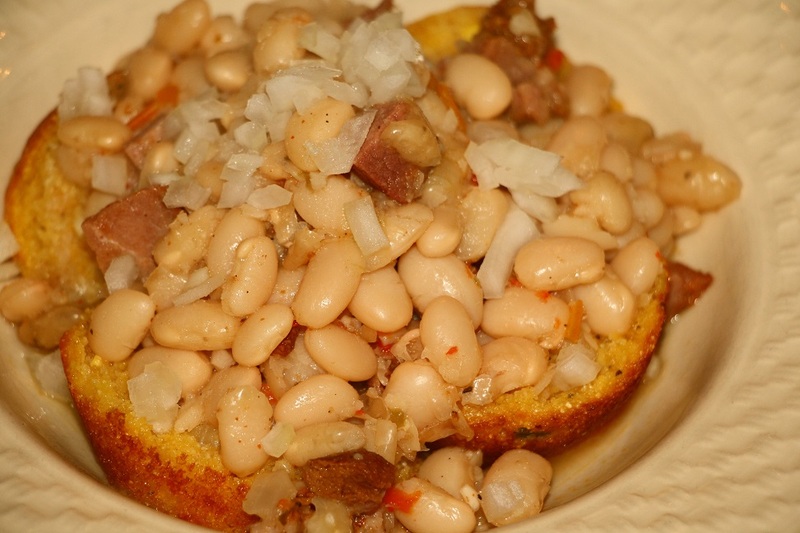 Reduce heat to a simmer; cook 2 to 2½ hours or until beans are soft. 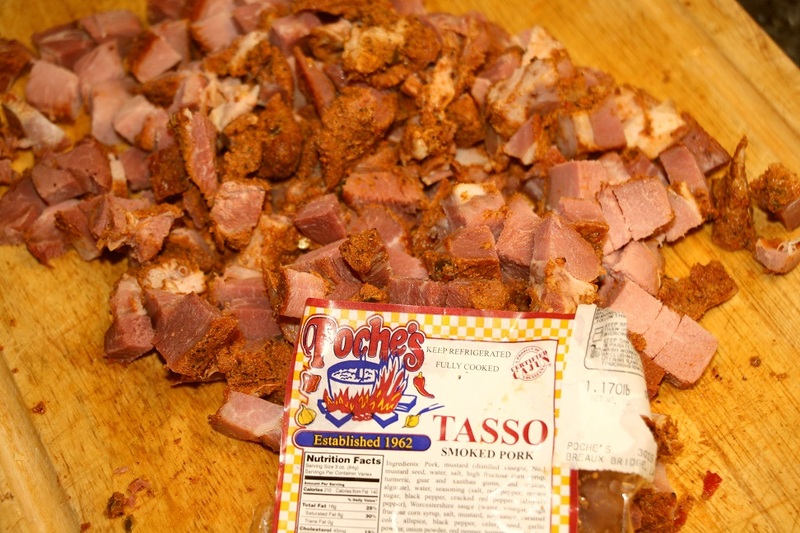 * - Tasso is not actually ham (hogs rear leg) but rather it is cured shoulder which is then rubbed with spices and smoked until fully cooked. We served it over some cornbread muffins and topped with a little diced onion. I thought it was very good and perfect comfort food for a rainy day. It had just the right amount of heat and using less liquid made it just the way I like soup.